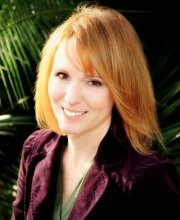 Lori Roy was born and raised in Manhattan, Kansas, where she graduated from Kansas State University. 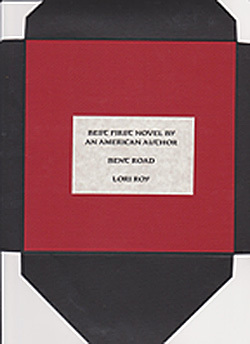 Bent Road, Roy's first novel, was named a 2011 New York Times Notable Crime Book and has been nominated for the Book-of-the-Month Club First Fiction Award and the Edgar Award for Best First Novel by an American Author. She currently resides in west central Florida with her family. While fending off houseflies with her church bulletin, Celia had spent her first Kansas sermon looking from one hometown parishioner to the next, noticing, as they shifted about on the pews and swatted at flies, that they all had the same overgrown ears and fleshy noses. There were a few, probably in-laws like herself, and the priest, Father Flannery, who hadn't inherited the trait. And as she studied them, she felt them studying her. Her navy blue skirt was too proper with its sharp pleats and tailored waistband. The other women wore skirts that ballooned over their large hips. They wore floral scarves, not gossamer trimmed hats. Theirs were white cotton blouses, wrinkled and nearly gray. Hers was a silk print, hand washed and dried flat on a towel. By the end of the service, Celia even looked at Arthur, crossing and uncrossing her legs so she could turn unnoticed to study the size and shape of his ears and nose, but he looked outsider, and Ruth, too, with her delicate brow and graceful neck. Reesa, however, could have birthed the entire congregation. Standing at her own kitchen sink, Celia pushes aside the yellow gingham curtains and white sheers and takes in her first icy breath since moving to Kansas two months earlier. Outside the window, the waxy leaves of a silver maple filter quiet rain. The leaves flutter in the gentle breeze, their silvery white undersides sparkling beneath the gray sky. Even on the hottest August days, the tree had cast a cool, heavy shadow over the kitchen but the sprinkling of golden leaves among the green reminds Celia that soon the tree will be bare. Leaning on the counter, rinsing a colander of white beans that have soaked through the night, Celia misses her Detroit kitchen window. She misses the sound of Al Templeton pull starting his lawn mower, Sarah Jenkins beating her kitchen rugs with a broom handle, the garbage truck hissing in the back alley. Before Ruth came to live with them, Celia took her walks along the dirt road, walking as far as County Road 54 before heading home. She needed fresh air, she would tell Arthur, and some time to herself. But what she really needed was a place to cry where no one would hear, a place where she could cry so hard that she choked and hiccupped and when she was done and her nose had stopped running, she would return home, saying her allergies were acting up or the wind and dust had reddened her eyes. She never told Arthur that she cried because she missed home and her parents, even though they were both dead. She never told him she missed walking Evie to school or visiting with the other ladies in Ambrozy's Deli. She never told him that she cried because in Kansas she is still afraid. She is afraid that he won't need her in the same way. She is afraid she'll never know how to be a mother in Kansas. And mostly, she is afraid of being alone. Q:When you were growing up who influenced you as a writer? A: I didn't have any serious aspirations to be a writer when I was a child. I flirted a bit with the idea, as most children probably do, but I never saw it as a career path. I did read a great deal, and when I found a book I enjoyed, I would read it over and over. As I look back on the books that have stuck with me from childhood, I think it's the voice that drew me. One of the first books I remember devouring again and again was The Outsiders, by S. E. Hinton. From my very early days as a reader, I remember searching the library for Laura Ingalls Wilder books. Another favorite, which I continue to read as an adult every few years, is To Kill a Mockingbird, by Harper Lee. Q: What does it mean to be a writer? What do you enjoy most about your life as a writer? A: A writer is a person compelled to share something of themselves with the world. A writer is also a disciplined person, willing to work every day toward an uncertain end. A writer is thick-skinned and resilient. A writer must be confident but not over-confident. And I'll say it again, a writer is a disciplined person. I most enjoy the discovery. I don't work with an outline, so as I write and get to know my characters, the story unfolds. The downside is that I go through numerous re-writes as I try to find the story. The upside is finally figuring it out. Q: What did you learn about yourself in the process of writing your first novel? A: I was a tax accountant before I began writing. The accounting world is relatively orderly. There are carefully labeled workpapers, calculations that are checked and double-checked, rules and regulations that give precise guidance and certain deadlines. I operated quite well in this environment and I would have thought the orderly process of the accounting world would have carried over into my writing. In fact, it has not. Though I have tried to work with an outline, I haven't been able to do so effectively. I write a great deal that never ends up in a book because I'm never quite sure where the story is going. My research, though it starts out three-hole punched and neatly filed, ends up a jumble of notes and loose sheets of scrap paper spilling from an over-stuffed notebook. I write character sketches that end up lost under a pile of misfiled research. All in all, I am suprised by the choatic nature of my work, but I have come to accept that this is my process and I don't try to change it. A: When writing Bent Road, the plains of Western Kansas first inspired me. This is a part of the country that can be extraordinarily beautiful and peaceful. Sunset over the plains, for example, is a gorgeous sight. But it's also a part of the country that can be grim, harsh and even deadly. Consider the Dust Bowl era. I'm also fascinated by the people who stayed and made a life in Kansas when those dry years of the Thirties hit. The resilience and the grace of this generation certainly inspires me. Q: What advice do you have for aspiring Kansas writers? A: My best advice is to extend yourself to other writers. Find a writers' group or a conference, work with other writers and do all that you can to help those writers improve their work. Learn the craft and apply the principles when you critique. As you do this, you will gain a better understanding of the craft and of your own work. Q: Tell me a bit about some of the contemporary authors and books you enjoy reading. A: I enjoy writers who blend literary and genre fiction, which is to say they are able to craft well-rounded characters, meaningful settings, gorgeous sentences and still have a firm grasp on plot. This is an extremely difficult undertaking and a few of the authors who I think do it quite nicely are Mary Lawson, Daniel Woodrell, Thomas H. Cook, Megan Abbott and Denise Lehane. If ever I find myself stuck, these are some of the writers I turn to. I open up one of their books, read a few sentences and they get me back on track. Two writers with area ties have won Edgar Awards, the top annual prizes of the Mystery Writers of America. Candice Millard of Leawood won the Best Fact Crime award for her riveting work of 19th-century history, "Destiny of the Republic: A Tale of Madness, Medicine and the Murder of a President." The book recounts the shooting of President James Garfield and the drawn-out medical drama that followed. In telling that story, Millard brought Garfield out of the historical shadows. "When you're writing about a 130-year-old presidential assasination," Millard said Friday, "you never expect to win a mystery writers' award, but it's great fun and a real honor." 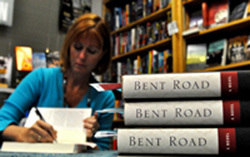 Lori Roy, formerly of Manhattan, Kan., won the Edgar award for Best First Novel for "Bent Road," which is set in Kansas. A critic for The Star called it an "impressive, atmospheric debut novel of the late 1960s" in which "a father transplants his family to his rural Kansas roots from urban Detroit, trading nagging concerns for explosive secrets." 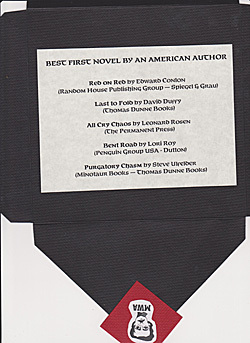 The Edgars, named after Edgar Allen Poe, were given out Thursday at a ceremony in New York. Among other winners, the Best Novel award went to "Gone," by No Hayder. "In Lori Roy's haunting first novel, BENT ROAD, Arthur Scott tries to escape the volatile racial climate of Detroit in 1967 by moving his wife and three children to the tiny Kansas town he left after the violent death of his sister 25 years earlier. Writing with a delicate touch but great strength of purpose, Roy creates stark studies of the prairie landscape and subtle portratits of the Scotts as they struggle to adjust not only to their rural surroundings but to their troublesome relatives and taciturn neighbors..."
"Bent Road is a long, winding journey, just like its titular street, where murder comes from love, friendship turns to ash and family bonds strengthen only through the worst sort of circumstances. But Roy is in full narrative command, taking her time to point the reader to the next direction, but always certain--even if we are not--that what comes next is what must happen, not what we hope or wish would transpire." "In a kind of Old Testament math, the variables in this account are shame, sin, secrecy and vengeance. ... Psychological acuity, tight plot and in-depth character development keep the reader trying to resist the urge to read ahead. " "Roy is calculated in the way she builds and eases tension...even the simplest scenes crackle with suspense."